RUSH: By the way, the Comey memos regarding Trump and Flynn, do you know what they really reveal? They reveal that Trump had a lot of reservations about Flynn’s judgment. It wasn’t just related to the phone call he had with the Russian ambassador who went to lunch all the time, Sergey Kislyak. According to Comey’s memos, Trump’s reservations about Flynn were numerous, and they were related to his judgment. Trump was not confident of it. Now, in case you’re asking, no, there were no Comey memos ever of any of his meetings or time spent with President Obama. You might say, “Well, why was that?” Well, come on, “why was that?” It is clear that Comey thought there was something seriously wrong with Trump in that he’s an outsider, Trump’s an outsider. These guys were not prepared for Trump to be president when he was. This effort to document Trump’s insanity, craziness, whatever, was part of the plan all along, Comey either wanting to write a book or be able have evidence for claims he was later going to make. But it’s been clear from the outset that there was some kind of a coup going on here, silent coup it has been called, we referred to it as that. And I don’t think there’s any doubt about that. I have a couple sound bites that I want to play for you. Up first is Michael Zeldin. Michael Zeldin is a leftist through and through. He is a leftist lawyer and his outpost is CNN. Oh, I should have mentioned this. Comey, in his memos, reveals that it was pressure from CNN that made him reveal the Trump dossier. He essentially admits that the director of the FBI was intimidated by the journalists at CNN. Now, we all thought that it was BuzzFeed, but it turns out it was CNN that was pressuring Comey to reveal and release the Trump dossier. And Comey did. But whether it was CNN or BuzzFeed, the point is the media was in on this from the get-go in that they have been on the same page as everybody investigating this. They were willing, willing, willing accomplices. The media had known about the Trump dossier for months. And it had not been revealed because and it had not been corroborated. It could not be verified. It was opposition research. The media knew that. They wanted it in the public domain as legitimate intel anyway. Comey writes that it was pressure from CNN, but also James Clapper, who was Obama’s Director of National Intelligence, the DNI. But this what I mean. The Comey memos, to me, indicate the conspiracy. I mean, they don’t spell it out, but if you have any kind of logical ability to draw conclusions from what’s right in front of your face, it is clear that all these people are working together and that Comey’s memos are to try to memorialize this in such a way that it wasn’t a conspiracy, that all of these events happened as they happened with no preplanning and that they were trying to react to things. When in fact everything here was part of a plan to go public with as much evidence as they could, true or not, that would make Trump look bad. Now, back to Michael Zeldin. Zeldin is a regular commentator and analyst at CNN. And he goes back to the Clinton era. I remember this guy on TV all during the Lewinsky scandal. He was major, major defense analyst for the Clintons in that episode. And he was on Anderson Cooper 360 last night talking about Comey’s memos. And this is what Michael Zeldin said. ZELDIN: As I look at the Comey memo that talks about let Flynn go, it doesn’t create for me a compelling case for obstruction of justice. I think there’s a lot of room for people to argue what it was that was at the heart of what the president was asking. So if this is the case upon which you are a gonna try to bring an obstruction of justice case, I think, well, maybe you gotta look for some additional evidence. RUSH: That was Gloria Borger going, hmm, hmm. It was actually a pained, oh, no, really! You have to understand, folks, these people have been devoted, absorbed, committed 24/7 for a full year on the idea that Donald Trump colluded with Russia to steal the election from Hillary Clinton and then obstructed justice, as valiant investigators attempted to unlock this sleazy puzzle. A whole year, folks. You know it as well as I. I’m just reminding you for the power of the persuasion. A full year they have been invested on the notion that Trump stole the election working with Putin and the Russians. And then, after succeeding, then obstructed justice, stood in the way of brave, courageous investigators, trying to unlock the truth to save our democracy. And yet Donald Trump thwarted them at every turn. But they remain committed to the cause. They remain committed to producing the evidence that Trump stole the election. So here comes the latest installment in, “Is this it? Is this it? Is this the smoking gun?” Comey’s book. Now the Comey memos. Somewhere in there is supposed to be the silver bullet that kills Trump politically. And hear comes Michael Zeldin, “Ah, look, I kind of hate to tell you people here, but the memo here, this does not create a compelling case for obstruction of justice.” You can just see the wind come out of everybody on set at CNN. Gloria Borger, Anderson Cooper, you can just see the deflation happen. 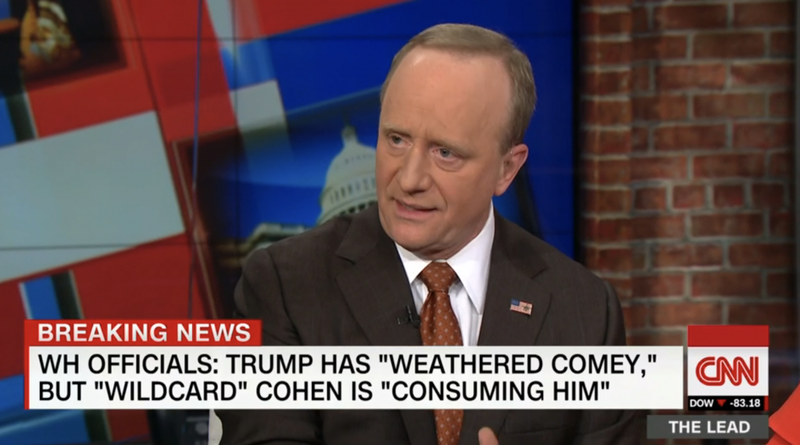 BEGALA: If it were hurting the president, Democrats would be running on it. I’ve talked to scores of Democrats running for Congress. None of them are gonna run on Mueller, impeachment, Stormy Daniels. They’re gonna run on the tax bill, which they think is unfair to the middle class, they’re gonna run on Medicare, they’re gonna run on Social Security, and I think they’re gonna win on that. That’ll be the weather vane that tells us. And I think the Democrats are right to run on those middle class economic issues, not on this stuff. RUSH: Whoa, whoa, whoa, so here is a primary architect of the Democrat campaign saying, hey, if this were true the Democrats would be running on it. Remember the question. Tapper: Do you think this book and the book tour is hurting Trump at all? Forehead: If it were hurting the president, Democrats would be running on it. Scores of Democrats would be running for Congress. None of them are gonna be running on Mueller, on impeachment, Stormy Daniels. Why not? That’s all the media’s talking about. The media’s not talking about Medicare. The media’s only talking about the tax cuts when they lie to people. Do you believe this, by the way? Do you believe that still around 50% of the America think the tax cut is only a tax cut for the rich even though everybody is getting a tax cut? That is because the media has been lying about this from the first day it was proposed, they have been lying about who gets a tax cut, how big the tax cut is, who it’s aimed at. And they were the first to fire a shot on it. They were way out of the box on this. The Republicans didn’t think they needed to have any messaging. A tax cut’s a tax cut. Everybody likes tax cuts. Not in 2017, 2018 America, not with as ill-informed, ill-educated the American people are. To them now, tax cuts equals tax cuts for the rich only, tax cuts for corporations. Even though they have much more disposable income in every paycheck. So you heard The Forehead say, they’re gonna run on that, they’re gonna run on the lie of tax cuts. They’re gonna run on Medicare. What else did he say they’re gonna run on? Social Security! What? Are the Republicans threatening to cut Social Security or something? No. The Republicans never do that. But the Democrats say they do. Every four years, the Democrats accuse Republicans of wanting to take away old people’s homes, old people’s food, old people’s dogs, gonna take away their walkers. They’re gonna take away Social Security every four years. But why aren’t they? They have just spent the last year, the media has, trying to convince everybody that Trump is illegitimate, that Trump shouldn’t even be president, he stole it, he cheated with the Russians. We got Comey’s book, we got Comey’s memos, we got the Mueller investigation, why aren’t the Democrats going to run on any of that? 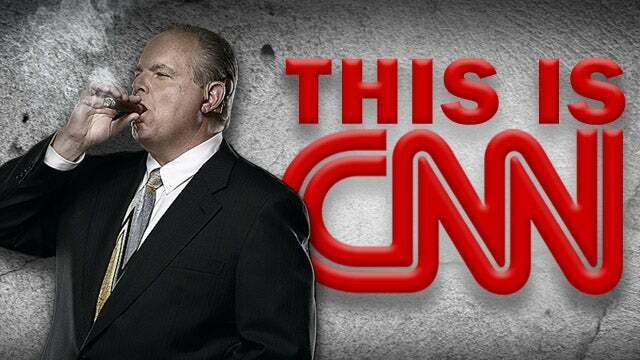 RUSH: You stop and think about this. The entire focus of the Democrat Party that has created all of this motivation to vote, all of this anger, all of this energy, all of this news that created this massive advantage in the generic ballot. The Democrats aren’t gonna use any of it? The Forehead says the Democrats are not gonna campaign on the very things the Democrats and the media have been using to stoke all of this hatred, to fire up all of this motivation. Remember we’re told Democrat voters, they’re so motivated, they’re so angry, they can’t wait. They want to vote today. They want to get to the polls and they want to vote today. Why? ‘Cause they’ve been convinced that Trump stole the election, the Republicans cheated ’em again! Now it’s time to gear up for the election itself, the midterms, and The Forehead says none of that’s gonna be on the table. Why is that, folks? Their voters aren’t gonna know what to do here. The Democrats are running the risk here of taking all of this hatred, this emotion, this intimidation, this motivation, whatever it is, and diluting it. It’s fascinating to me. So it’s another reason why I think we’re getting near the end of this. And I’ll tell you what else I think about this, as we got on with Rudy and why he’s been chosen, what’s gonna happen here. But I need to get to a call. Always want to start in the first hour with calls on Open Line Friday. We are gonna go to Westchester County, New York. Steven, thank you, sir. Hi. CALLER: Maha Rushie, thanks for taking the call. CALLER: You said earlier that you’re kind of laughing at this whole DNC lawsuit thing with the collusion thing. I was at first too. But I still have a grave concern that since we do know that – whether it’s the FBI or the CIA or both of them — they can put any digital fingerprint on hacking an email that they want. So they can make their own evidence, and I’m really concerned about that. 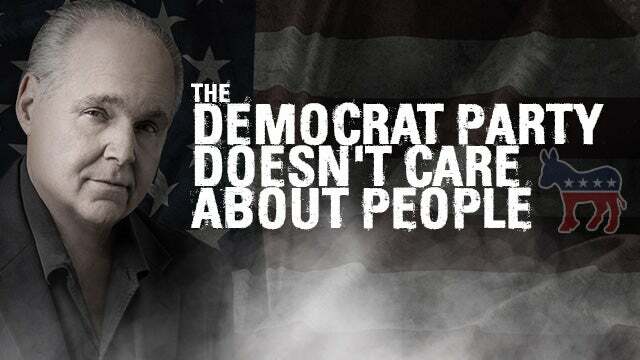 RUSH: — suing the Democrat Party and the Democrat National Committee — and throw the Russians in just for good measure — because that’s who really got screwed here. That’s who was colluded against: Crazy Bernie. CALLER: Oh, we know that for sure. We’ve known that for a very long time. RUSH: Look, I understand your concern, and your concern is the result of information you’ve heard and digested and learned. See, he’s very clever here. He remembers a news story that the CIA was hacked. The CIA was hacked, and among the things the hackers got was software that allowed the CIA to hack anybody and make it look like it was anybody else. They had the ability to, quote-unquote, “leave Russian fingerprints” on a hack that they did, or Chinese fingerprints or North Korean fingerprints. The NSA lost a bunch of software like that too. We still don’t know who got it. But Steven here remembers. And what he remembers is that the CIA and the NSA — the American intelligence community — has the ability to intrude, to infect, to hack any computer or network and then make it look like somebody else did it. So his concern here is they can go in here and leave the fingerprints of, say, Ronna Romney or Reince Priebus (laughing) or somebody. You know, leave Trump’s fingerprints — except Trump doesn’t use computers. He only uses phones to tweet. I understand the concern. But believe me, this is gonna end up being thrown out of court — and believe me, the purpose of this is publicity. You have to couple this with what we just heard The Forehead say about the issues the Democrats are gonna be campaigning on. They can’t drop this! But if they’re taking all of these issues, Trump, Russia, collusion, obstruction, impeachment… If they’re not gonna use that to win the House back, they’re gonna go after other issues. The tax bill, Medicare, Social Security? Tell me that that’s an exciting agenda. Once again, the Democrats are admitting here they’re gonna run on fear. They’re gonna be accusing the Republicans of wanting to take things away, when the Republicans are doing nothing but giving people things. But over here is the lawsuit where they’re gonna be able to, they hope, get some opposition research in the form of depositions, and just the existence of the lawsuit will allow them and their media buddies to further the idea that there was collusion and that they’re serious about finding it. “Maybe Mueller couldn’t, but this lawsuit’s finally gonna ferret it out.” It’s a way to keep it in the news, make it look like Democrats — ’cause they’ve gotta keep money rolling in. They’ve gotta keep the donors happy. And, by the way, they’ve raised a lot of money. And if they drop what it is that raised them a lot of time money, they’ve got heap big trouble.